If you're designing a new kitchen, you're probably questioning which is the best kitchen worktop material for you. You may already have your wall colours picked out, cabinets designed and an idea of what look you want from your kitchen worktop. But which worktop material – wood or stone, concrete, composite or metal – will suit not just the look of your new kitchen, but how you will use it, too? The options may seem endless, but it’s worth taking the time to get this hardworking surface right. Think about how you plan to use your kitchen: will there be lots of cooking, or is your aim to entertain and impress lots of guests? If you use your kitchen primarily for cooking, what's your food preparation style – making everything from scratch with lots of cleaning in between, or is your approach more hands-off, sparing your kitchen surfaces constant cleaning and wiping? How you answer these questions will impact your choice of kitchen worktop material. Follow our guide to choosing the best kitchen worktop types for you. Use our ultimate guide to planning, designing and budgeting for a new kitchen to get your new kitchen just right. Your kitchen worktops will be used for preparing, serving and, potentially, dining and will need to withstand regular, intensive cleaning. They’re a natural focal point in your kitchen, complementing the kitchen cabinets and kitchen flooring, and have become a key part of the design process. 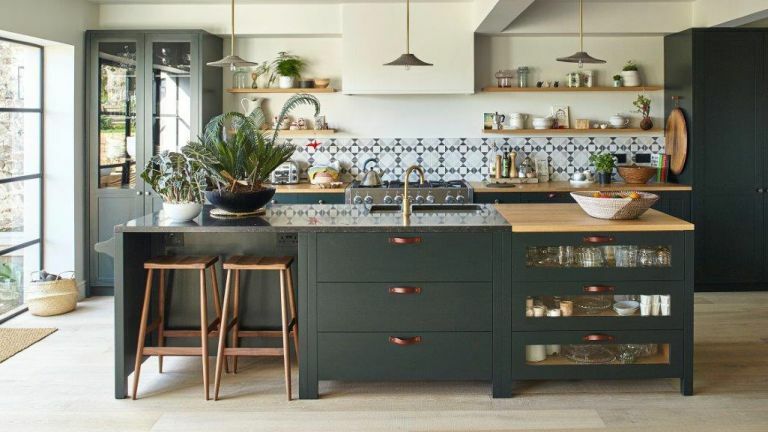 You’re going to be using them multiple times a day, so it’s important to choose a kitchen worktop type – or types if you're picking more than one material for your kitchen – that you like the look of, as well as a surface that will suit your lifestyle. Are you prepared to maintain worktops that need it (ie, marble, wood) or do you want a maintenance-free material? Do you tend to put hot pans straight on the work surface or do you tend to use a trivet? Are you prepared for the upkeep of a high gloss work surface or would a matt finish be better suited to your family (ie, you have small children who like to touch everything)? The primary factor to consider when looking at the best kitchen worktop types is material. The most common options are stone, wood, man-made composite and laminate, each coming with its own unique properties. Natural stone and wood, with their varied colours and markings, look stunning in a traditional kitchen, but can scratch and stain, requiring sealing and regular maintenance. A fuss-free alternative is a man-made composite material, such as quartz or Corian, which blend natural minerals with resin to create highly durable surfaces that are non-porous and easy to clean. However, these can be costly and require specialist fitting. If you’re on a budget, laminates are the best choice. Comprising a plastic overlay and design layer bonded to man-made board, they can mimic hundreds of finishes, from weathered wood to veined marble, at a fraction of the price, while being water resistant. Alternatively, zinc, stainless steel and concrete are becoming increasingly popular as a way to achieve an on-trend industrial look. Granite is one of the most popular choices for kitchen worktops. It’s stylish, beautiful and is associated with luxurious kitchen design schemes. ‘Granite is the result of cooling pressurised magma over millions of years resulting in a rock that is both heat and scratch resistant. When sealed properly it is also stain resistant and, once installed, requires no more maintenance,’ says Jon Brewer, managing director and founder of Purple Granite. Granite is an all-round winner kitchen worktop material. It is far the most low-maintenance choice, so sturdy that it's unlikely to chip or scratch, and only needs to be resealed once a decade. Supremely heat-resistant, granite can easily withstand all your hot pans placed on top of it. The only thing to be mindful of is that you'll be that little bit more limited in your choice of a splashback: you can't have a coved backsplash in granite, so typically you'll need to go for a full-height panel splashback instead. A man-made alternative to materials such as granite and marble, industrial tecniques are used to fortify natural quartz with resin to create a truly hard-wearing and customisable worktop. ‘Quartz has become ever more popular over the years and offers a more uniform, contemporary stone work-surface. It is naturally resistant to staining and scratching, but is less heat-resistant than granite, ‘ adds Jon Brewer of Purple Granite. One of the most attractive features of a quartz worktop is the combination of a natural stone look and feel with the low-maintenance properties that are usually expected from synthetic materials. Quartz is actually even more durable than granite, in the sense that it is even less prone to chipping and requires only occasional resealing. The biggest downside of a quartz worktop is the cost; expect to pay around £500 per square metre, and that's before installation costs. There may be a way around this, as some companies, such as Granite Tranformations, offer 'topper' worktops made from granite or quartz. The 10 milimetre-thick worktop simply fits on top of the existing worktop. Whether you are after a contemporary or traditional kitchen, hard wood is a great solution, as long as you are willing to put the work into its maintenance (see below). The drawback with wood compared to stone or composite options is that it requires biannual oiling to keep away stains and damage. However, you may see this as a benefit as the worktop will age over time, gaining a beautiful patina. Laminate is a cost effective and versatile worktop solution and has become the most popular option on the market. Laminate worktops may look good on paper, but you get what you pay for. Cheaper options will damage easily and may not carry some of the benefits listed above. Make sure you shop carefully if you are considering laminates because there is a huge variation in quality. Glass has only recently been introduced to the worksurface market. It is stylish, versatile and works perfectly in a contemporary design. Want to visualise your perfect contemporary kitchen? Have a look at our contemporary kitchen ideas gallery. Marble is a hard crystalline form of limestone, historically used in architecture and sculpture, hence its associations with classical elegance and luxury. Marble is visually striking due to the naturally occuring streaking in the stone. It is one of the most popular worktop materials in luxury kitchens, both traditional and contemporary. Marble looks incredibly elegant, and should be on your radar if you want a luxury, statement kitchen. This material is also always cool to the touch (due to its poor heat conducting properties) – a valuable functional trait in a hot, steamy kitchen. The main con is that marble is a high-maintenance material, vulnerable to staining and scratching, so may not be the best choice in a busy family kitchen. Want to see what marble worktops look like as part of a luxurious kitchen design? Have a browse through our luxury kitchen design ideas. Solid surface worktops are made by applying an acrylic resin to the top of a substrate material like wood. They create a seamless, glossy worktop that fits perfectly into a contemporary design. These solid surface materials are great for modern kitchens. They are heat and scratch resistant to a point, but can’t compete with solid stone or quartz. Although the resin exterior is waterproof, if any water gets within the substrate material, it can cause irreparable damage. Stainless steel is the go-to worktop material in the commercial kitchen sector, and is perfect for industrial-style kitchens. Stainless steel is still not very popular in homes because it can become overwhelming when used in large areas. However, there is no reason you couldn’t use it to make a statement and take advantage of its benefits on a kitchen island or in a small workspace. Cavendish Equipment have a gallery of case studies that may convince you that stainless steel can be a beautiful option. Find out how to clean stainless steel to keep your worktop looking in top condition. And have a look at our gallery of inspiring industrial kitchens. ‘Something I expect to really take off is a product called Neolith. It’s a porcelain product that is heat resistant, scratch resistant and can be book-matched. Boo-kmatching is a process where two pieces of the same stone slap are joined to create a mirrored pattern in the surface. This was only previously possible using quarried marble which, as well as being expensive, is nowhere near as durable as Neolith, ‘ says Jon. Concrete worktops look beautiful in industrial style kitchens but concrete does have its drawbacks as a worktop material – so why not get the looks of concrete with the pros of a quartz worktop? The Topus Concrete quartz worktop was inspired by topological strata – fossilised textures built up over time in veiled layers – and combines the mineral formations found in nature with the rugged patinas of industrial materials, giving this surface movement, opacity, and depth. A great alternative to real marble, ceramic worktops with a marble-inspired finish make a luxurious addition to a kitchen and can be paired with any other material, from timber to metal. The Ceralsio collection from CRL Stone is a beautiful, hard-wearing and versatile range of ceramic surfaces, built for the demands of modern living. Ceralsio surfaces are suitable for kitchen countertops, flooring and wall-cladding and are available in a natural, textured or polished finish and a wide choice of colours. Prices start from £350 per square metre. Specialist natural stone and composite worktops are usually included as part of a bespoke fitted kitchen and supplied by the cabinetmaker. However non-specialist laminates and some timber worktops can be bought in standard sizes or by the metre, then cut to size and fitted by a tradesperson or you, if you are fitting your own kitchen. Kitchen worktops are big investments so, once installed, make sure you know how to care for them – the kitchen supplier will usually advise. For impenetrable man-made composites and laminates, soap and water or a mild detergent is all that’s required, but wooden worktops, which are easily damaged, will need oiling at least once a year. Follow our guide to cleaning and caring for your wooden worktops.